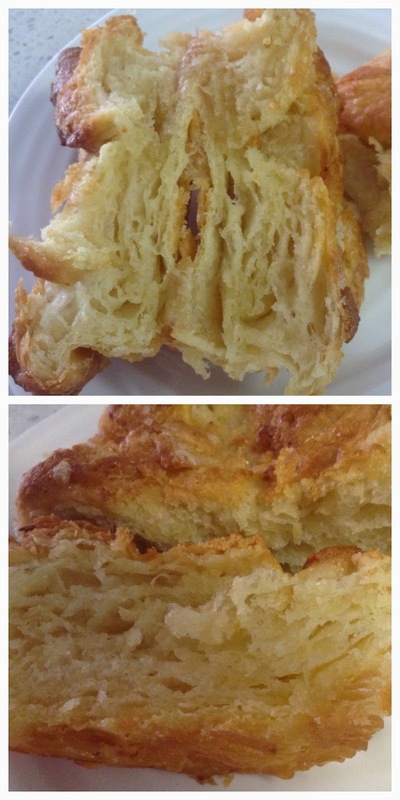 Well I was hoping that we would work up to the Kouign Amann. It's a pretty intimidating looking pastry for the less-than-confident yeast baker. And without giving away the ending, although you can see the lovely layers in the book cover photo, I have to say it's difficult to really understand the fuss. That is, until you taste it. But more on that later. It's the time of year we call the 'build up' in my part of the world. This is the three or so months where the humidity and heat build up so much that it always seems on the verge of raining, but no relief comes. It's the most challenging time to live in the tropics. And also to make pastry and biscuits, or anything with butter. So, with some trepidation I went to work on the Alpha Bakers' first challenge with the aircon cranked up and the ceiling fans on high. I decided to take my responsibility as an Alpha Baker seriously (at least for the first week) and got out all the ingredients before I needed them (see photo evidence below). In fact I took it so seriously I flapped around nervously for a while until I got into my stride (by reminding myself Rose can't actually see what I'm doing in my kitchen...) and started to enjoy myself. The recipe for the Kouign Amann starts with making a basic dough with bread flour and instant yeast. I don't have my stand mixer yet* so I thought I'd try out the previously untested dough paddle on my food processor. I pulsed the processor to bring the ingredients together successfully, but it took off like a rocket when I put it on the lowest speed. I certainly couldn't have left it on for the recommended (for a stand mixer) four minutes. Surprisingly it didn't look too bad after a minute of accidental speed kneading so I took it out and gave it a bit of gentle inexpert kneading by hand until it seemed to match the description in the recipe. The best thing about yeast cookery is that when it goes well it's obvious and quite exciting. The dough is left to rest for a short period initially and when I came back my heart skipped a beat when I saw the yeast was alive and well and the dough was rising. After that it was an exhilirating blur of rolling and then resting the dough in the fridge, rolling and resting, for most of the afternoon. Okay it wasn't all exhilirating - in fact by the end I was thinking it wasn't something I'd make again. That was of course before I tasted it. I was fascinated that the dough looked to have expanded even though it had been in the fridge for an hour (or half hour if you misread the instructions at first). You can see in the photos below that the dough looks lovely and puffy where it has come out of the fridge in its little folded packet. When rolling out pastry or dough I always find it difficult to judge the correct thickness, so I loved Rose's instructions for the size of the dough after rolling. And if I had to wash my sewing tape measure at the end, it was worth it. As I said the initial dough is not fancy but then you add a great slab of butter to it. This is what you then spend the afternoon rolling, folding and resting. Then you add a great swathe of sugar to the layered dough and butter, and roll and fold that in also. Even with all that butter and sugar,at this stage, without any other flavourings, I was still wondering just how interesting the pastry was going to be. Despite the raging airconditioner, I realised (afterwards of course) that I should have put the waiting dough back in the fridge when I was rolling and shaping the pieces. 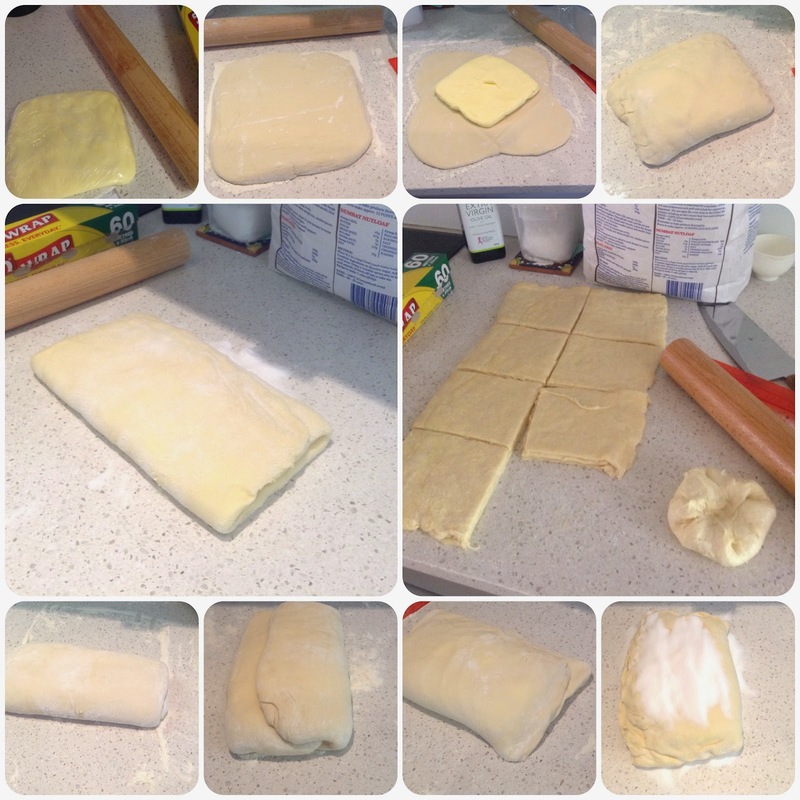 The butter in the dough became a bit too melty and made it very difficut to shape and stick the pastries neatly. And even though I measured the pieces (not weighed) some of the pastries were a bit bigger than others. I spent a bit of time looking for the required pastry rings, which in Darwin is a matter of about three likely shops ('you're looking for what?') and then pondering the benefits of ordering them online. I really didn't want to make a big investment in them so I ended up finding four reasonably priced crumpet rings and making the other four out of alfoil as Rose suggested. They both worked well. I should have tried one without a ring just to see what would happen - I presume just spread a bit further? 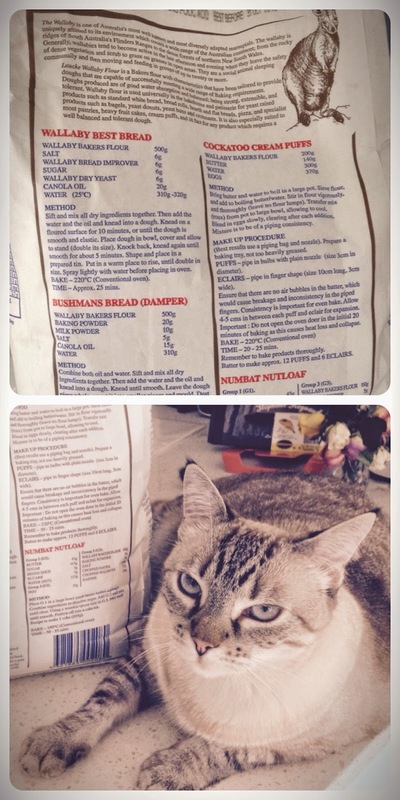 The back of the flour bag with some slightly cheesy Australiana. * Just a friendly reminder, Father Christmas. Congratulations on making these in sweltering heat! And I laughed when you told yourself that Rose can't actually see what you're doing in your kitchen too. I sometimes feel that I have to hide things from her, and when I'm baking with Woody, Rose actually IS in my kitchen! Your Kouigns look wonderful. It's funny how no matter how different the pastries look, the common theme is their deliciousness! you poor thing you must have been really in the worst hot that you can imagine by baking those pastries too but they do look very nice very nice indeed they do and I am one of the new girls that's going to be baking along. Hi Maggie, nice to meet you! I'm going to pop over and visit you right now. i have a cat that looks like he could be related to your numbat! it's nice to know that Rose's recipes can withstand a bit of bumbling, isn't it? Hi Jen, yes I was amazed that with all my 'mishaps' they still turned out delicious ( if not perfect). You can't ask more from a recipe than that. They are gorgeous!! Perfectly browned. Mine had some blackened sugar on the edges and bottoms, but when we tasted them they didn't taste burned, thankfully--just carmelized. I'm so glad to be baking along with you and the rest of the Alpha Bakers. Thanks Michele- I did wonder whether the insides could have done with another 5 minutes although they really were delicious anyway! They look yummy and the cat is cute too! Thanks Glori. Flossie doesn't like it much when I bake because it's not about her...! I love your helper - I have a furry helper too. She likes sugar so I had to quarenteen her while I was making my kouigns amann. I hope you'll stop by for a visit and see my blog post. Until next week! Your KA's look delicious and your pics are good too, especially the last one. I'm not an Alpha Baker (though I hope to be soon). I enjoyed your post. If you want to see how the KA's went for me, I'm at http://www.thefinercookie.com/new-blog-1/. Enjoy the journey ahead. Hi Kimberlie, thanks for the compliments. 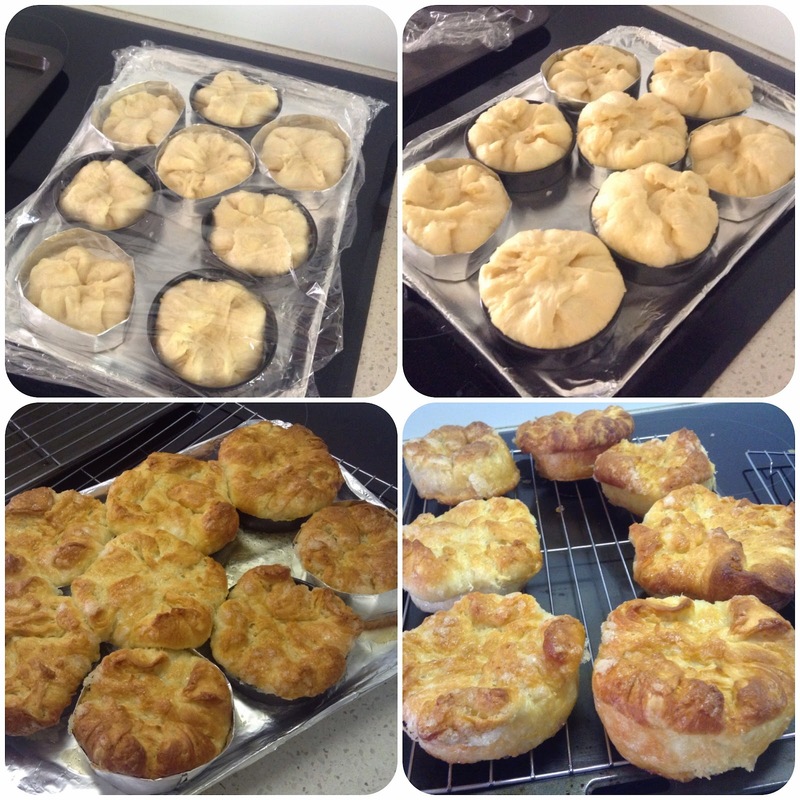 I'll definitely have a look at your Kouigns - it's so interesting to see how many different approaches can achieve the same result (more or less). What a delightful post! I think we must be kindred baking spirits! You expressed my sentiments exactly. My dog parked herself under the bread board to pounce on the flying sugar. Honestly, caramel describes them perfectly. I couldn't put my finger on it. My husband thought there was honey in the recipe. Seriously, the next recipe assignment is literally and figuratively a piece of cake! Hi Phyllis! Loving your pastries. They look fluffy and wonderful! We have the same climate at the moment..LOL! Thankgoodness for airconditioning! I've not visited Darwin..hopefully one day i'll be able too. Hi Catherine - they looked amazing. Amazing you got a perfect result in Darwin - I do remember that Aussie response of "You're looking for what?!?!" Drives me banana when I am home! !